Would you like the lettering in shiny gold or silver foil, or crisp and intense black? Personalise these Chicago Score Cards just the way you want to. 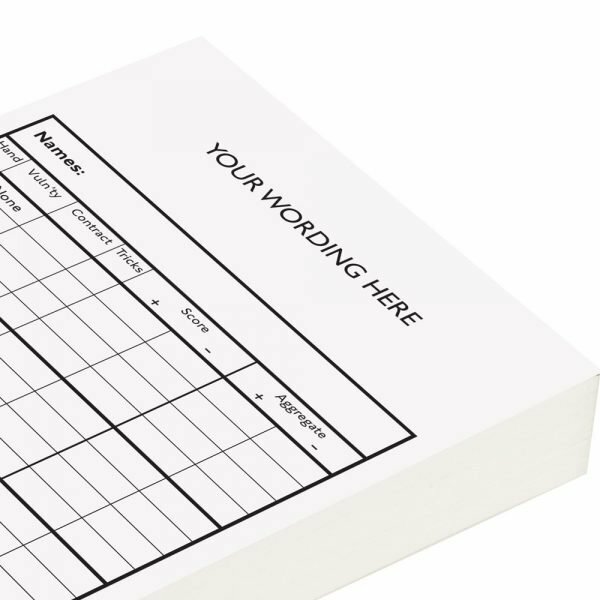 Each top-quality 300gsm Conqueror Brilliant White Wove card comes with a blank area at the top that you can write your very own personalisation on to. The Chicago Bridge score card beneath is designed to give you maximum space for scoring. How about using our hand foiling service to add a touch of elegance to each card? For an additional fee we can hand foil – in our Devizes workshop – a custom message along the top of every score card. Choose from either gold, silver or black foil to get something truly custom to you. Hand foiled score cards make a perfect gift for a loved one or close friend, which many of our customers have chosen to do in the past. 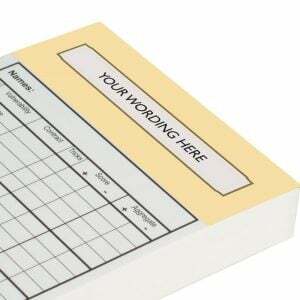 Score card / pad size: 99 x 210mm (the size of a standard compliments slip). Important Note: Personalized products are not returnable or refundable. Please check your spelling carefully before you add this product to your shopping basket! Our Chicago Bridge score cards complement perfectly our range of Emporium playing cards. If you like to colour co-ordinate or add a dash of panache to your Bridge games then you have the option to buy matching or even contrasting playing cards to suit your style.